I have a tattoo on my back that’s almost a secret. My partner is the only one who has looked up close. It feels like it’s sometimes there and sometimes not. The nature of the art is permanent but it feels like it moves fractions of an inch up or down, peeking out above tank tops and summer dresses. When I get out of the shower, sometimes I round my spine to look at it in the mirror, the words like a projection, distorting as my skin moves over my ribs. I got it on a lonely weekend in September four years ago. I had just moved in with my boyfriend but he was gone. I like living completely alone but living with someone else and having them absent leaves an emptiness deeper than solitude. All of his friends who at the time were all of my friends were also gone to cabins in the woods to talk about science and stay up late on the beach having drunk conversations you can only have outside so the words don’t stay. Our apartment was big for the city with deep red wood floors and a balcony deep enough for plants we never grew. He’d lived there for three years and I gradually claimed space, my shoes behind the door, two types of butter in the fridge, a stack of books he’d never read by the nightstand with my glasses on top, until I put down a deposit for my own set of keys and became a full-time resident. We moved all of my things on a late summer morning rushing to get everything out of the truck before the afternoon rains broke, both of us irritated at the logistics but forcing positivity on each other. We’ll be together. It’s going to be great. When I was ten, my mother told me a story about how when she was in middle school, one Friday night she invited one friend over, then another, then another, and no one could come. She sat in the bathtub and cried and cried until the water turned cold. She didn’t know why she was so sad. They couldn’t come over for any of the regular reasons that young girls can’t come over. It wasn’t about her. But I knew why, and I was angry when she told me the story, angry that she could see that part of me, the part that ached for other people. I told her that she was too sensitive. I’ve never been good at intimate friendships. I don’t think I’ve ever been my best friend’s best friend. I used to blame it on not having sisters but plenty of people don’t have sisters and still have friends they know deeply. Sometimes I think it’s because I don’t like to be in focus. I’d rather someone just get the sense of me, the feeling, to know the melody, not the words. I didn’t realize until a few years ago that at least half of what people think of you has nothing to do with you at all. I never fully unpacked in that apartment. My art leaned against the wall behind the bar filled with bottles with only a shot left in them, my kitchen supplies were boxed in the closet and raided when we need something obscure and specific. If I got anything new, it found a home with us, like the pitcher I got at a gift exchange that I filled with flowers when we had guests to make up for the fraying wood-trimmed couch, but everything I brought with me stayed in boxes or haphazardly stacked on the wooden folding table I bought for $20 at a garage table and refinished by hand, my sole furniture contribution. When we’re pushing each other with jokes that aren’t really jokes, my partner says that my grandmother is my best friend. She turned 95 this year. When she turned 90, she started taking pains to document her life. She produced a book of letters that no one else knew existed from the bowels of a house she hadn’t lived in for fifteen years and smoothed them out over all the beds of the children who’d left. They were from my grandfather and started after World War II. He died when my mother was twelve from a heart attack on a cruise ship. It was the first night and they were still docked, sitting down to their first meal in the fine dining room. He was young and half healthy, a former professional baseball player who still coached. He was a pilot during the war and had been shot down. He never talked about it, but he smoked at least a pack a day and drank too much too often. My mother can’t stand crisp white tablecloths. We have two pictures of him in my parents’ house. One is a formal portrait, his hair wispy even at twenty, gazing somewhere to the left of the camera, the focus soft and glowy. In the second, he’s sitting on the side of a boat, cigarette in his mouth, wearing swim trunks and untangling something, his eyes at his hands. Even in black and white, he looks sunburned and strong. The way my grandmother talks about him has convinced me that you only get one great love in your life. She remarried after being alone for more than ten years to another man who died before I was born whose last name she still has. But I only know about John Thomas. They met prior to World War II, when her college was used as training grounds for the young and enlisted. She had skipped two grades and was the youngest in her class. They were introduced on a double date, more as chaperones for their roommates when girls weren’t allowed out with boys alone. Before he deployed, he proposed. She said no, said she didn’t want him to marry her out of fear, and that they’d talk when he got back, like his trip to France was a vacation or semester abroad instead of dropping bombs on Nazis. A week later, she changed her mind and followed him on the train. She got off at the station in Wyoming to a telegram from his mother. He married a girl he’d met at a bar, drunk and scared and 21. He was on a boat to Europe. She got back on the train. After she graduated, my grandmother moved to Washington, DC, and worked for the FBI as a decoder. She was good at math and languages, and she excelled at it, deciphering clicks and characters from across the sea. She went to parties with the other girls in her boarding house as dates of the higher ranks with no skin in the game and broad, glinting shoulders in dress uniforms with bachelor apartments, their wives at home, states away. She wore full skirts and drank martinis and was home by curfew every night. John Thomas broke her heart but she kept long distance tabs on him anyway. His plane was shot down somewhere in France and he was captured as a prisoner of war, presumed dead. When he came back, he promptly filed for divorce and wrote her a series of letters. The paper is thin and jaundiced, but she sends it to my aunt in an insured package to make photocopies which she then sends to me so I can get to know him, with a gentle nudge to type them up if I feel like it. I lay them out on my living room hardwood in chronological order. I haven’t seen another person in twenty-four hours. The first night alone, I eat cheese and crackers for dinner right out of the cellophane, and re-watch old Julia Roberts movies. I sleep on the other side of the bed, just to see what it’s like, but I wake up at a loss. I don’t have any plans all day, all weekend. My face is oily and my glasses slip down my nose. A french press is too much coffee just for me but I make it anyway and drink it all slowly. I’m alone and lonely in a way that feels beyond the absence of people, lonely in a way that makes me call my own personhood into question, unable to determine my own boundaries without feedback. 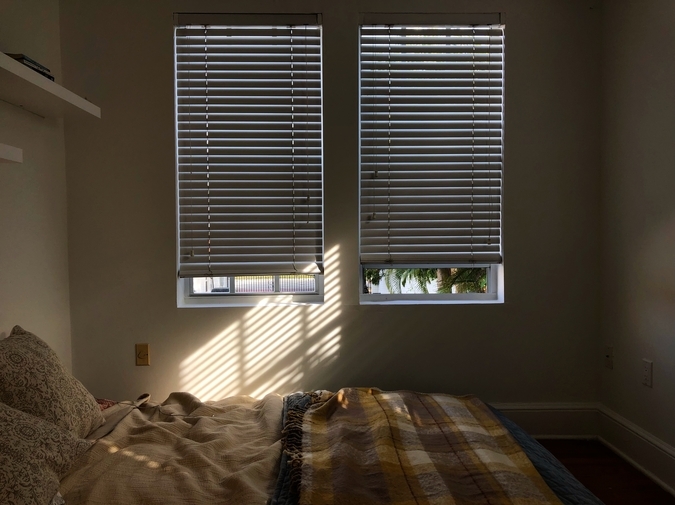 The room, the apartment, the whole city feels empty, the sounds of the neighborhood depressed by the first cold day, everyone in a self-imposed exile. The first letter, dated November 1945, is even and deliberate, with a greeting hard-pressed on the paper. He says he’s in school at Boston University and has a job as a high school teacher to make ends meet, listing an address that’s half a mile from my first apartment in Fenway. About the war, he’s sparse, and would remain so for the rest of his life. In the next letter, he rambles, like this is any other letter catching up, until the postscript, the letters tight and deliberate. “PS What is a cryptograph? What were the last two words of your letter? Can our friendship be renewed? She only answered two of the questions, and he writes an unprompted three-page confession of the marriage and subsequent divorce, calling it “a thumbprint sketch of a very unhappy episode.” She says that’s the last they spoke of it, that the war was something of a reset button. Everyone who made it out had new lives to build with whatever they had left. Over the course of three months, he moves from handwritten half sheets to legal pads to typed letters on a “pint-sized Remington portable,” which come with handwritten notes on the bottom and margins, and signing “John Bohan,” “John,” “Jack,” and “Baldy” (“I’m picking up a little extra money these days posing for some hair tonic people. They use my picture plus the caption, THIS COULD HAPPEN TO YOU”). He drinks coffee and sherry, too much, and compliments her in the only way she would accept, understated and honest. He’s winsome and light, self-deprecating and reflective. He looks for jobs and talks about his roommate Goodie and his girlfriend Bunny, the stewardess who’s breaking his heart. He’s charming but restless. He has “wild ideas” of the life he wants to live, the books he wants to write, the places he wants to travel, the man he wants to be. He makes all of his wants clear, any self-consciousness lost in the crash where the capacity for their manifestation was almost extinguished. He is honest and unpretentious about his ambitions. He went on to write volumes of poetry and own a donut shop, to have two girls who carry his freckles, and to die too soon next to the woman who loves him still. I take pictures of his handwriting and blow it up in Photoshop, studying the words. I email the images to myself, take a shower, and walk across the river to Cambridge. I don’t remember actually making the decision to do any of this, but I go. It’s cloudy and not quite fall. My hair is still wet when I announce myself as a walk in and sign the forms that I have good blood, no allergies. The tattoo artist is coming back from getting a sandwich and has ten minutes, which is all it takes. He puts on an old episode of The Simpsons. I lie on my side, clutching my clothes that are off my body to my chest and reading his bookshelf of Adult Swim DVDs. It doesn’t hurt in a way that I don’t want. I’m drawn towards extreme physical sensations and I want something harder. I like to run until my muscles feel like death, to sink into hot water until my skin tingles to numbness. Sometimes I feel lucky that I have a heart condition that means I absolutely cannot do real drugs. But not-real drugs can kill you, too, especially when you’ve seen your friends die, especially when you fell from the sky and didn’t. It’s slower, less expected, cardboard cartons and empty bottles, then a sudden gasp on starched linen on a ship that hasn’t left port. The tattoo artist doesn’t ask about my tattoo, what it means, why I’m getting it, if it’s my first, nothing. He’s like an ICU nurse or a wedding planner, working with people who will always remember him, remember the day their lives changed, when it’s just another Saturday. I’m glad I don’t have to talk about it. Any explanation feels reductive and cheap. He gives me a high five as I leave. I walk home exhilarated as the sun starts to fall, a dull pulse just below my shoulder blade. When Richard comes back, I take off my shirt and he traces the letters with his finger. Anna Held is a writer based in San Francisco.